Recognize this place where your favorite television show has been filmed? Of course, thanks to CGI, these original walls have been made even more dramatic for Game of Thrones, but they are incredibly scenic even without the television stars and special effects! 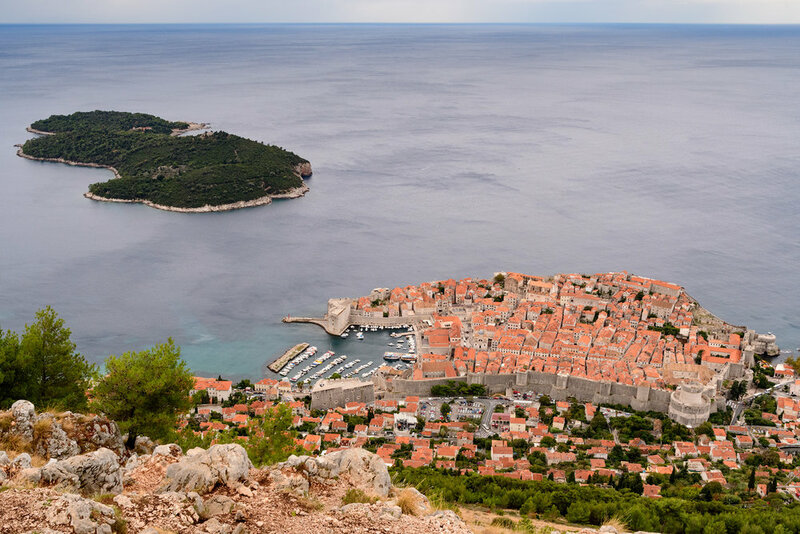 Recently, we had the opportunity to travel on Azamara Quest along the Adriatic Coast and visit the Dubrovnik area and the island of Hvar. 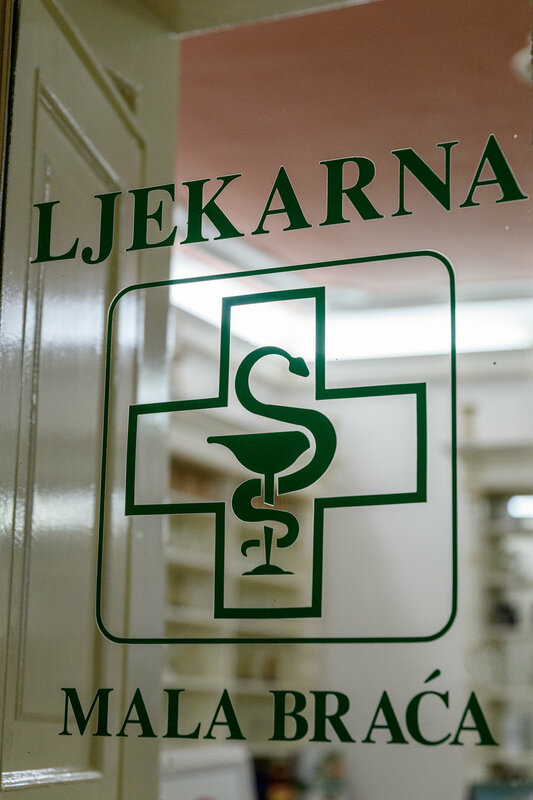 To see a little about our trip to Vukovar Croatia in 2014, click here. 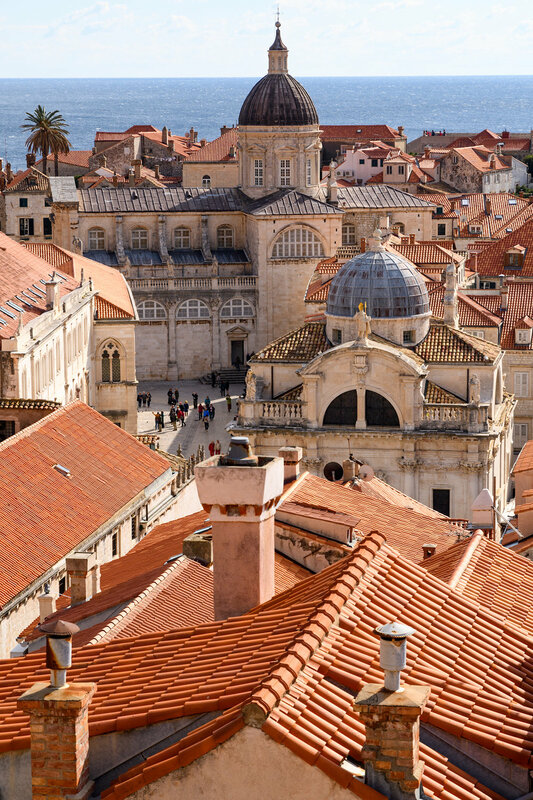 The walled city of Dubrovnik in the Adriatic with the famous red terracotta roofs. 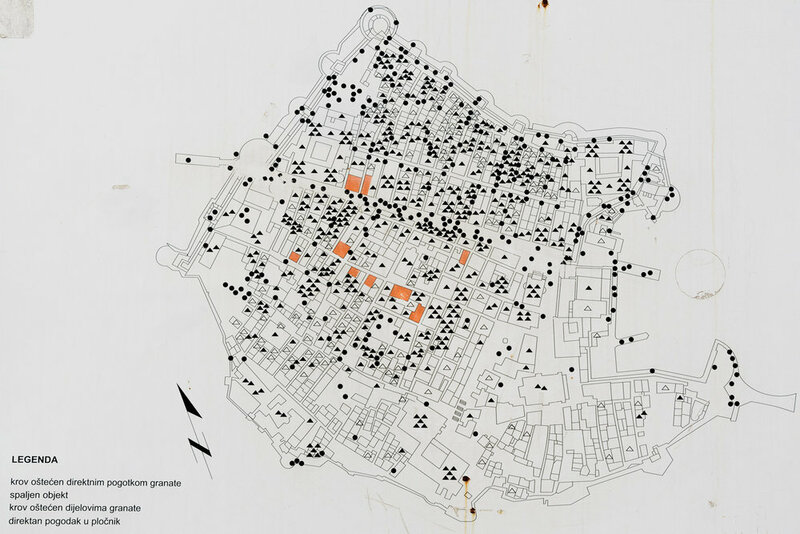 A map shows all the missile strikes from the Siege of Dubrovnik during the 1991-1992, the historic UNESCO Heritage site has been completely restored. Entrance to the city is via one of these two gates, inside the gates, an entire city grew up within the walls, with palaces and churches anchoring the civic life. Today, it stands largely as tourist destination, although laundry hanging from the upper floors of buildings indicate some people still love there. 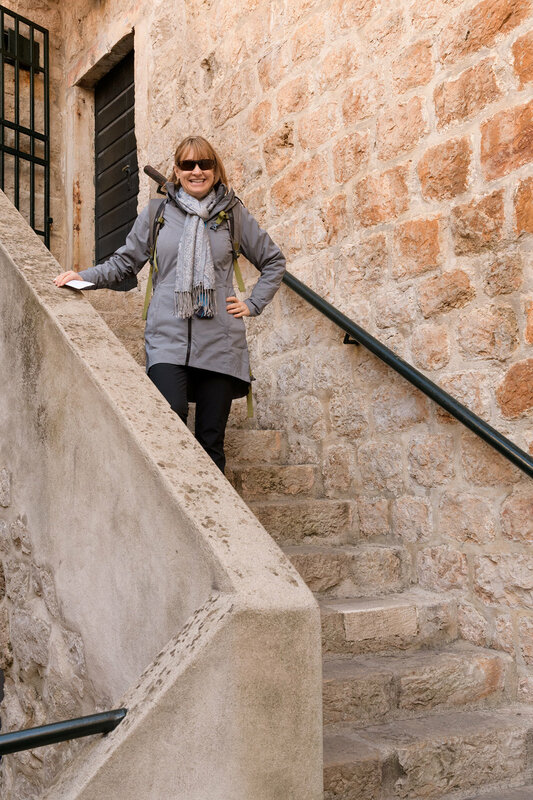 Another popular thing to do in Dubrovnik is walk through the Stari Grad (Old Town) along the Stradun (also known as the Placa) A guided tour helps put it all in perspective, but you can also use a guide book or audio guide to help navigate. We were generously gifted a private tour for the day with driver and guide from our travel Agent, Jenny at Travel Beyond through the Signature Collection. We met our guide, Bozidar and driver Luka at the pier, and they whisked us off in a late model Mercedes sedan. Even better than all that luxury, was the incredible knowledge and professionalism of our guide, Bozidar. There are entrances to the walls at Sv. Spas, Sv. Ivan, and Sv. Luka. You can buy a ticket at the ticket booths for 150 K ($23 at today's exchange rates) The trip completely around the city is just over a mile, but plan at least 2 hours to walk and enjoy the views. 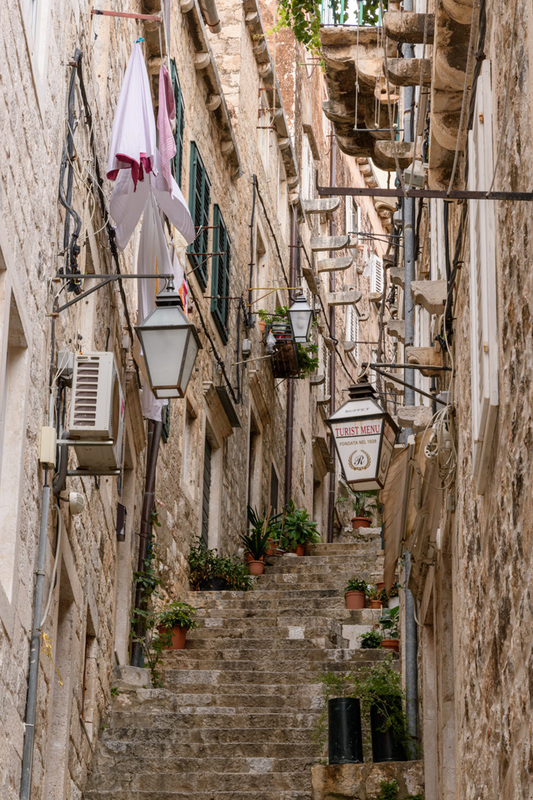 Although there are stairs in places, it's not a big climb, with only 25 m of elevation, usually there aren't more than a dozen stairs in any place once you get up onto the walls. Anyone who can walk over a mile and take a few flights of stairs, can probably walk the walls comfortably, there are even a few spots to sit and rest along the way. The view over the Old Town, the Church of St Blaise in the fore ground and the Cathedral in the background. 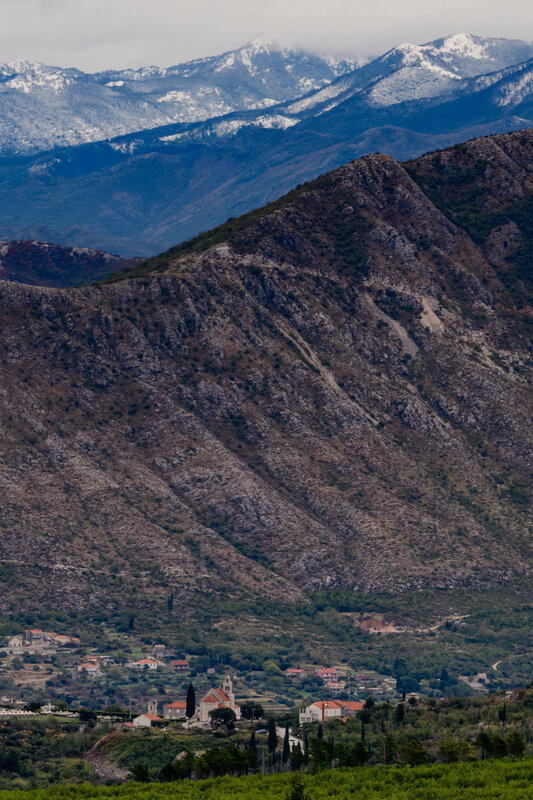 Below are scenes from the Old Town, click on any image to enlarge. The Stradun from above on the walls, with views of the Sponza Palace in the background and the near tower of the Franciscan Monastary in the foreground. If you have the opportunity, it's good to get up to the top of one of teh hills above the city. 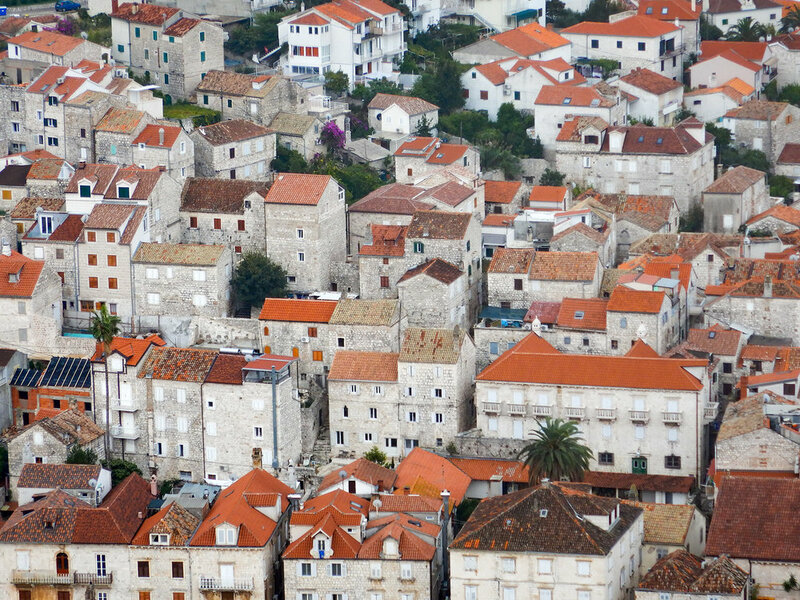 This allows you to see the perfectly walled city from above, as well as see all the way to the border with Bosnia on a clear day! We have a connection to Rochester Institute of Technology, and our daughter, and alumna, who was home house sitting for us, insisted we stop to see the Croatian Campus of RIT while we visited Dubrovnik. We decided we would ask our private guide if we could make a stop at the campus just to see it. What we didn't expect was that our guide would also be an alum of RIT! It didn't take long for us to learn that he had in fact graduated from RIT with a degree in Tourism, Hospitality and Service Management program. Of course, after getting an overview of the city from a high venue, we went back into the city and Bozidar took us to the RIT building where we had a little tour. One of the wonderful benefits of having a private guide is the ability to customize our itinerary for our specific interests, which in this case also involved a photo op at a University we support! Bozidar standing in front of his alma mater, and coincidentally, the alma mater of our daughter! 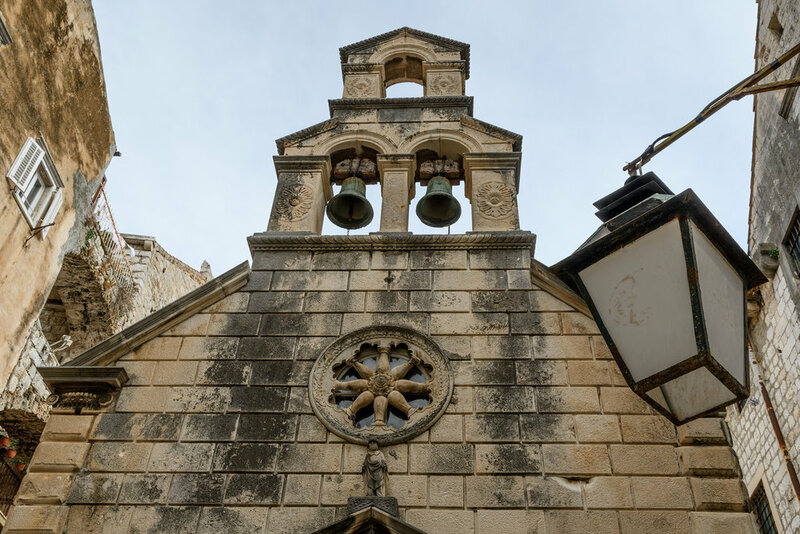 Not far from Dubrovnik is the small resort town of Cavtat with it's pretty parks by the beaches and historic Church of St Blais. We spent the morning visiting the small walled coastal town and hiking along the pretty beach path because there was quite a bit of coastal fog and we wanted it to clear a bit before walking the Dubrovnik city walls. Inside the walled village, there are many cafes and shops, two gentlemen enjoy a coffee on a cloudy Saturday morning. 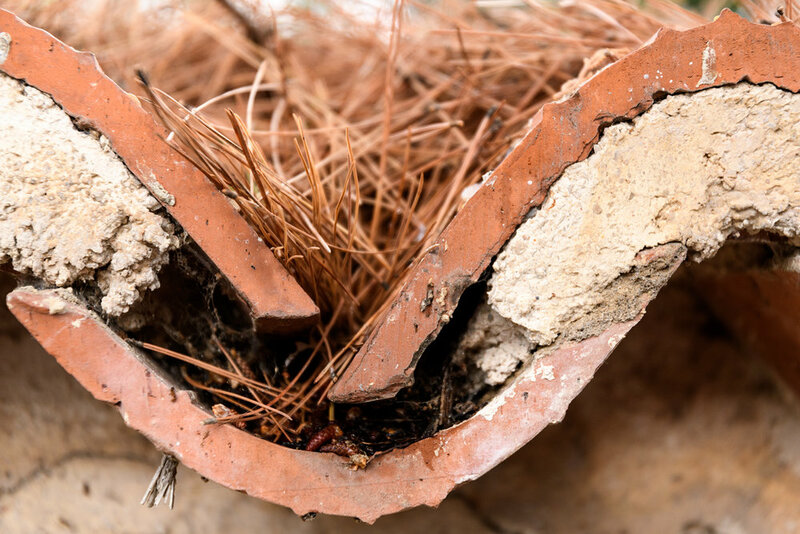 We were told that Cavtat is the place where the iconic red terracotta roofs were made, one tile at a time, traditionally molded on the thigh of the tile maker, which gives them their curve. The trail along the beach also has a small demonstration garden of local agricultural products including these olives! I never knew that both green and black olives grow on the same tree, the only difference is the level of ripeness! One of the rocky beaches that line Cavtat, and attract beach goers in the summer. We bid goodbye to Dubrovnik, enjoying the beautiful scenery as we sailed away. If you visit via land, I suggest getting out on the ferries or taking a boat tour to enjoy the views of the city from the water. Also the islands in the Adriatic have the best beaches in the country! 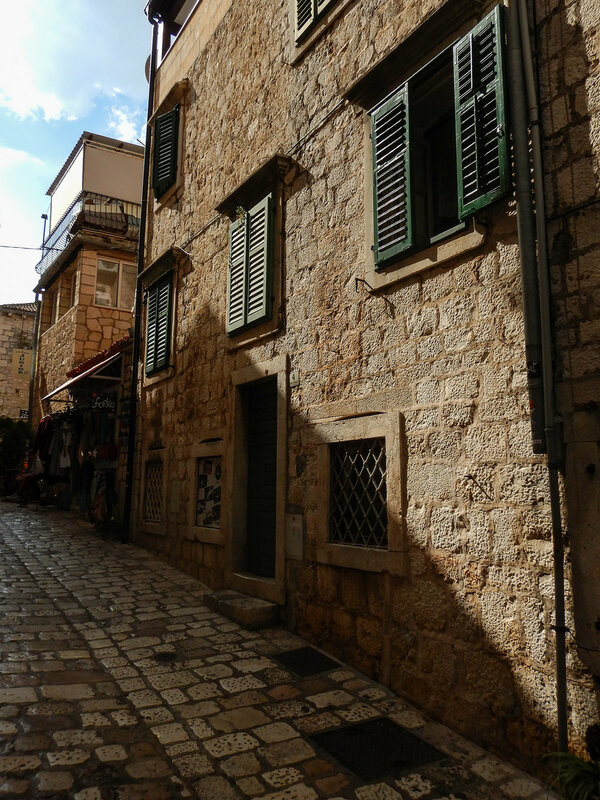 We visited Hvar Town on the island of Hvar in the Adriatic. 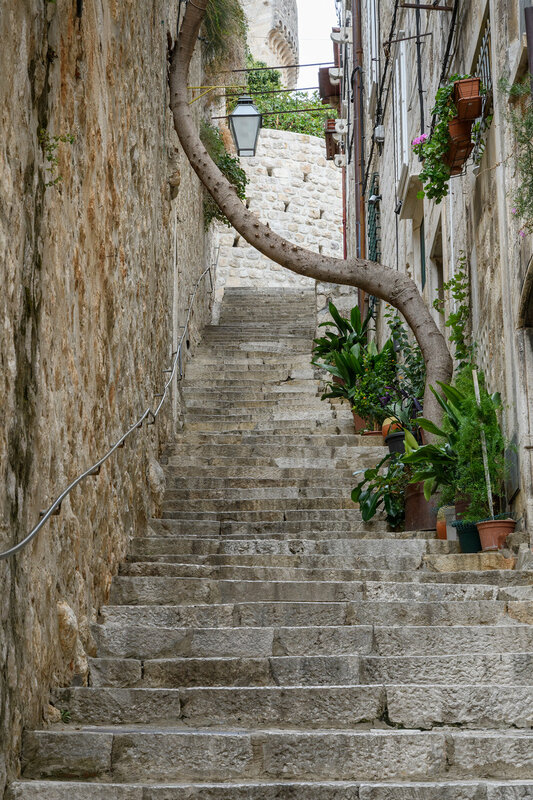 Like many of the places along the Adriatic, Hvar Town has been settled since ancient times, that means there is probably a walled castle somewhere. In Hvar city looming over the coastal village is the Hvar Fortress. Climbing up to the fortress is not for the feint of heart, with many steps between the coast and the entrance to to the fort. Fortunately, just when it seems like you've lost count of the stairs, the rest of the way up is a more gradual ramp with switchbacks! Be sure to stop at one of the banks to change your Dollars or Euros before climbing, the fortress costs a couple of dollars to get in, but they accept Kuna. There is an ATM at the fort, but you'll do better at the bank with fees. 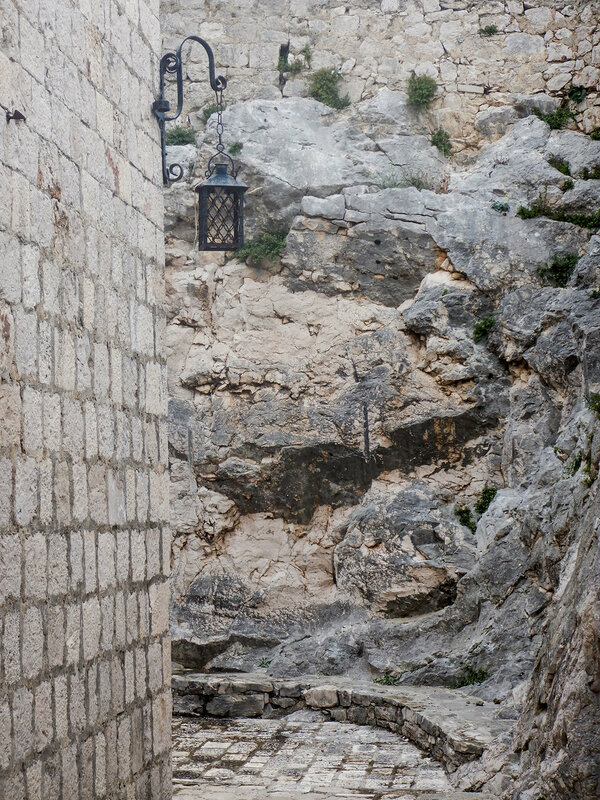 The stairs leading to the fortress are narrow, uneven and steep! But the sites and views are worth the effort! The coastal town is filled with cafes, shops and tourist agencies. The Cathedral of St Stephen sits in a square along with one of the oldest theaters in Europe. To visit the islands out off the coast of Hvar Town, you can take a private water taxi over to the small island of Jerolim for better beaches. Unfortunately, our planned trip to see the islands was thwarted by a squall that blew in and the taxis weren't operating the day we were there. 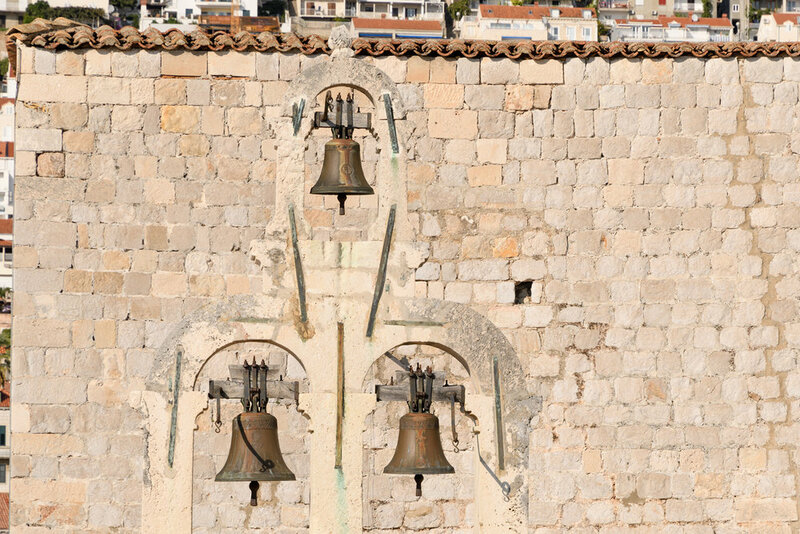 There are also several travel agencies and tourist offices in Hvar Town where you can book excursions and stays on other parts of Hvar, including the the Stari Grad or old town on the other side of the island where there are also more beaches.